The Formula Fairy: Free Formula?! Warning: if you don't have a baby in your arms or in your bump (or have an obsession with couponing), this post will be the most tedious read of your life. Don't say I didn't warn you. So, I have to admit that once I realized breastfeeding was a no-go, I had major Mama/Wife guilt about the increased cost I would add to our household by formula feeding. Prior to delivery, I assumed I'd be feeding this kid for free for the first couple of months of his life. Instead, we are heading to Target on the reg to stock up on the world's most expensive powdered milk. You can save a ton of money on formula and you can get formula for free! This is not a sponsored post, I just had a learning curve that could have been avoided if I'd known there were major ways to save. If you need/want to formula feed or supplement, make sure that you sign up with your chosen brand for their loyalty programs. 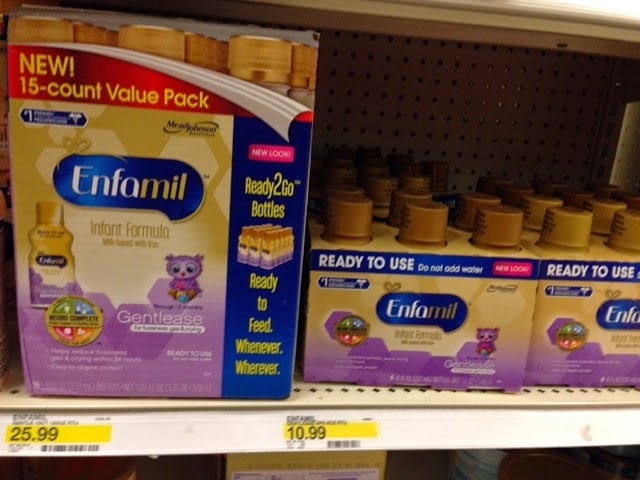 We currently use Enfamil because that's what they served our darling piglet at the hospital. As new parents, we did the most logical thing we could think of at the time and bought exactly what he was accustomed to eating (because someone who is 24 hours old clearly has a sophisticated pallet). at the advice of our pediatrician, we hope to switch to a generic brand in a few months when the babe's tummy is a little tougher. Until then, we're rocking the fancy stuff. 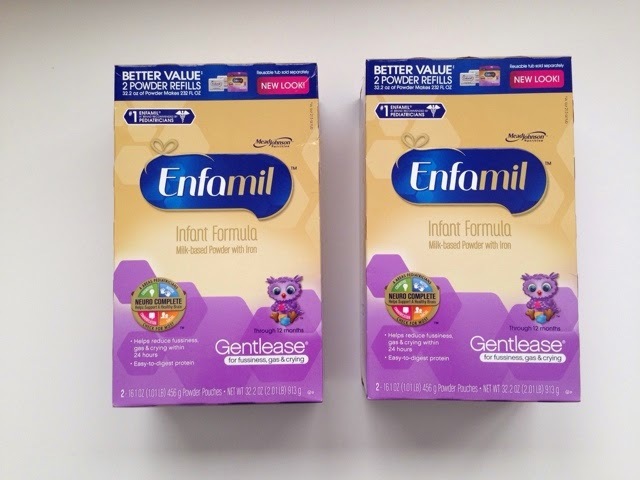 Anyways, Enfamil sends us free formula all.of.the.time. 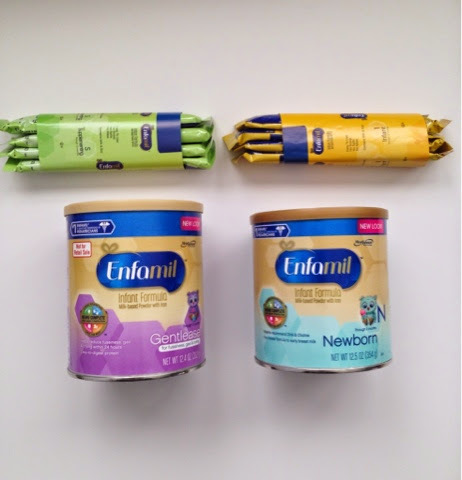 Our pediatrician and my OBGYN both happily gave us full sized sample cans as soon as they learned we were using formula and have encouraged us to continue to ask for them anytime we are in the office. 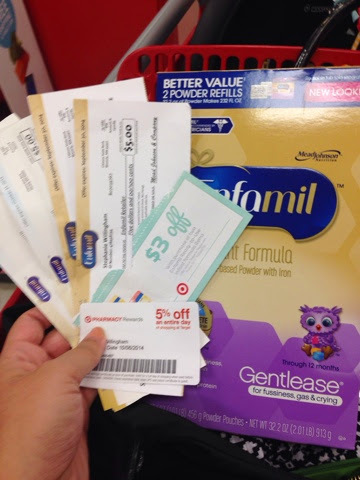 On top of the samples, I was surprisingly smart enough to keep all of the formula coupons that came in my baby registry welcome packets from Target and Babies R Us. Most of those coupons are good through 2015 and can be combined with the manufacturers coupons in store and online. On Monday I had a killer haul at Target and I have to tell ya'll/brag about it so you can save like I did! 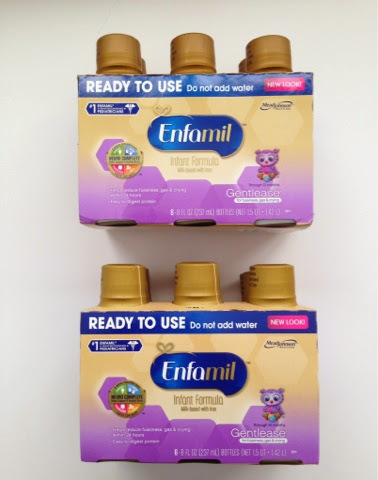 Ok, so Enfamil sends us "checks" that are for $5 off any Enfamil product. If you read the fine print, it does not say anywhere on the check that it cannot be combined with another coupon or that you can only use one per transaction. I had 4 "checks" stashed away and was able to use them all at once. I had 4 $5 Enfamil "checks"
2 separate $6 off coupons for my next Enfamil Powder Refill purchases. After heading home to celebrate my couponing genius, I realized that I wasn't quite done! 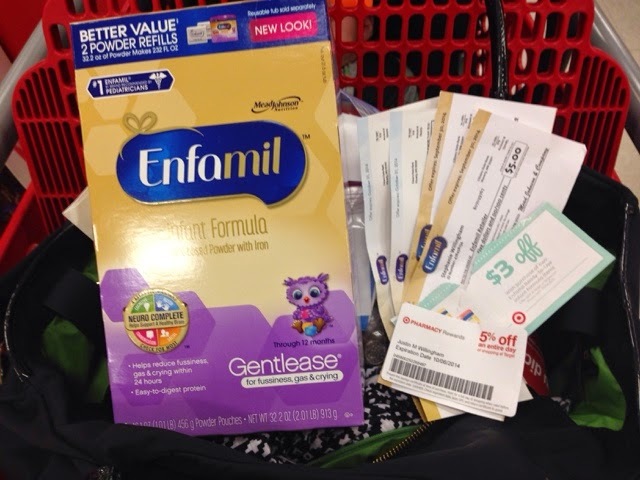 one more $5 Enfamil "check"
As a bonus, that transaction resulted in yet another $6 off coupon for Enfamil! 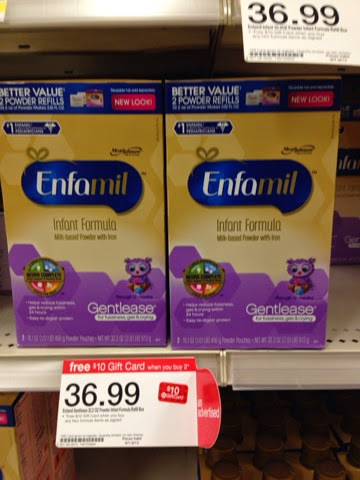 It's ok if you didn't follow that as long as you now know that you can save a ton of money on formula with store coupons, manufacturers coupons and can easily get free formula from the name brand companies! If you don't have a baby, I'm sorry you had to read that. In fact, I'm sure you gave up one paragraph in. It's cool, I still love you! Any other formula saving tricks I should know about?? Here is another cost saving tip that we used...if you are a Costco or Sam's member, you can use those "checks" there too (since they are not actual coupons). So, you are getting the cost savings of buying it from a warehouse store, getting a huge can of formula and still using a coupon:). Kudos to you on your Target scores! Doesn't it feel awesome when you save that much money?! Especially when that stuff is so expensive, ouch! I'll have to remember to keep all of the coupons and everything that come with the registry stuff just in case! Neither of my boys were able to use the regular formula like that. We were using the $36 per small can stuff, so I started ordering by the case online. You can sign up for Amazon Mom and get an extra discount by using subscribe and save. Free shipping and you don't even have to leave the house! Simon's special formula (corn based, ew!) wasn't even available via Amazon, so I ordered from babywuvinc.com. FYI - the Target up and up diapers worked great for us and are way cheaper than the name brands, plus you can still use cartwheel, mobile, and printable coupons.